Mandarin Oranges are a healthy fruit eaten in many cultures around the world. Some people like to eat mandarins ala carte while others like to put them on salads or in fruit salads. We have been selling Mandarin Oranges to restaurants for over 40 years for their salads and desserts. Mandarin Oranges are a great and healthy daycare snack for the kids as well. Buy your wholesale Mandarin Oranges from the leader in restaurant supply. Dole Mandarin In Light Syrup Single Serve Fruit Bowl - 4 Oz. Dole Mandarin In Light Syrup - 7 Oz. Dole Mandarin In Light Syrup - 4 Oz. Dole Mandarin In Orange Gel - 4.3 Oz. 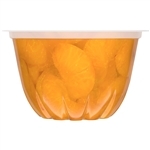 Candy Mandarin Orange Slices - 10.5 Oz. Restaurant Mandarin Oranges are a great dessert for buffets and restaurant salads. The health benefits of oranges are too many to list here, but include vitamin C to ward off illnesses, antioxidants to ward off cancer and dietary fiber for good digestion.